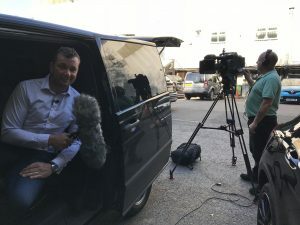 As part of a special BBC Wales Scrum V Sunday feature, Sean ventured to Sardis Road, home of Pontypridd RFC for their last home Welsh Premiership match of the season. The visitors? Cardiff RFC. Before the game Pontypridd were lying in 3rd position four points behind leaders Merthyr. They still had a mathematical chance of winning the League should results go their way. In glorious sunshine, a large crowd witnessed a physical encounter. Cardiff, with a depleted side due to a big injury list, looked the more threatening side for large periods of the game. But, with the vocal home crowd roaring them on, a late surge meant that Ponty ran out winners by 18 points to 8. It’s always a competitive derby match and the crowd at Sardis Road are always vey welcoming.